The India harmonic filters market was valued at US$81.1 mn in 2012. The market is expected to rise at an impressive CAGR of 12.80% from 2013 to 2019 to reach a valuation of US$188.5 mn by 2019, says a recent market study published by Transparency Market Research (TMR). The report is titled “Harmonic Filters Market in India - Industry Analysis, Size, Share, Growth, Trends and Forecast 2013 - 2019” and is available for sale on the company website. The report states that the rising demand for consistent power quality across various industries such as automotive, oil and gas, and IT and data center, among others, is the major factor driving the harmonic filters market in India. Moreover, in commercial as well as industrial applications, the increasing demand for variable frequency equipment that generate harmonics is supporting the growth of this market. However, high costs of harmonic filters, lack of awareness, and availability of substitute products are factors that are collectively impeding the growth of this market. In the coming years, the rising demand to safeguard optimum power quality, especially for IT and data center applications, will open growth opportunities for this market. In recent years, government regulations pertaining to quality of power have become strict in India and utility companies are imposing penalties in the instance of non-adherence to the stipulated quality. This is leading to increased adoption of harmonic filters in India. The report segments the India harmonic filters market on the basis of product type, voltage level, and application. By product type, active filters and passive filters are the segments of the India harmonic filters market. Of the two product segments, passive filters accounted for the larger market share in 2012. However, active filters will exhibit robust growth in the forecast period. This is due to the increasing awareness about the benefit of active filters to attain higher harmonic mitigation. The harmonic filters market in India is divided on the basis of voltage into low voltage, high voltage, and medium voltage configurations. Amongst all, currently, harmonic filters with low voltage are widely used. However, the demand for both medium as well as high voltage harmonic filters is slated to rise during the forecast period in India.In India, harmonic filters are used across several end-use industries such as automotive, IT and data center, and oil and gas, among others. 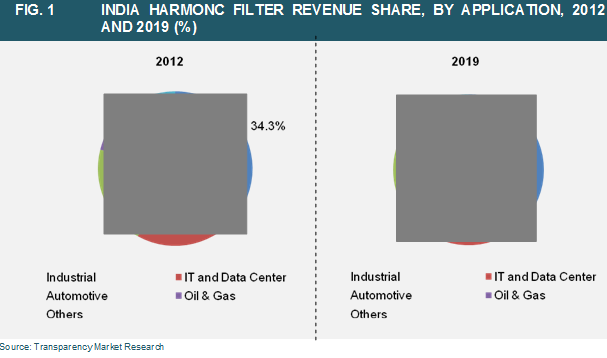 Among all the applications of harmonic filters, in 2012, the industrial application segment contributed highest revenue to the harmonic filters market in India. This is because harmonic filters are consistently used for the improvement of harmonics in drives.In the coming years, with increasing consumer awareness about power quality considerations, the automotive and IT and data center applications will expand their market share in the India harmonic filters market.